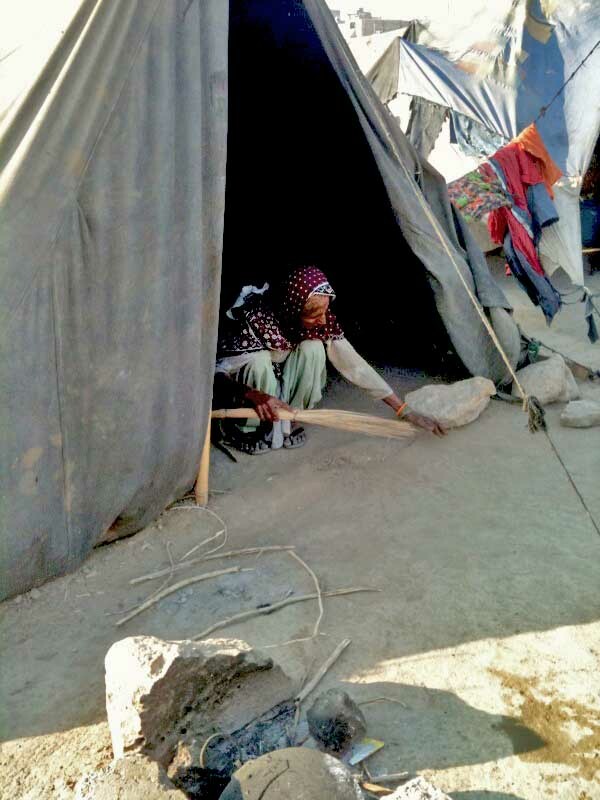 In the Keamari Town Camp for flood survivors relocated to Karachi, a woman with grey hair and strong capable hands sweeps the inside of her tent. It may be nothing more than a plastic sheet held down by four pegs, its makeshift doors flapping in the wind, but it is the hearth of her home. For now. Or perhaps forever. Her ever at the very least. Prepubescent girls collect sticks for the fire over which their mothers and elder sisters will cook dinner. 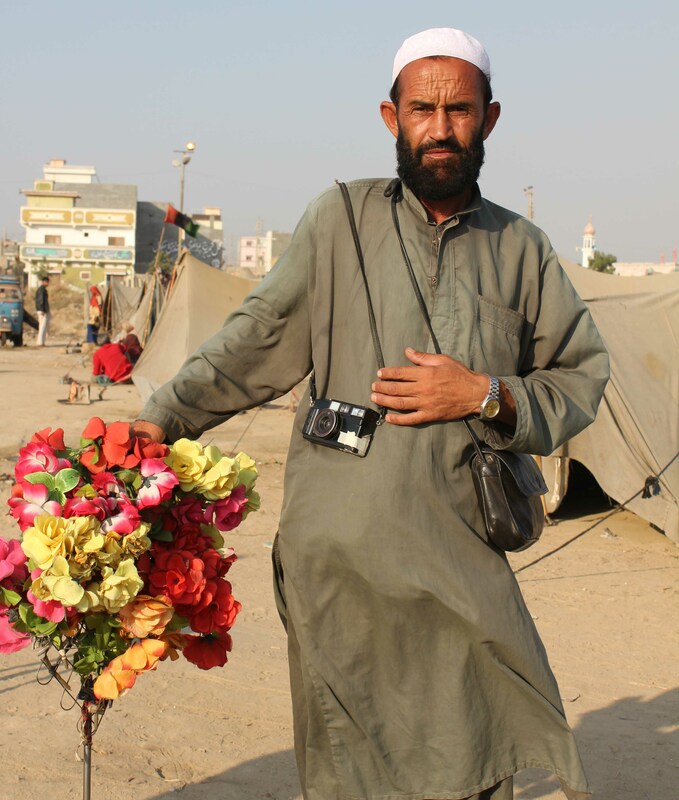 A man holding a knee-high metal stand that blooms in a bunch of fluorescent fabric flowers waits outside a tent. A camera dangling at his side, this is his mobile studio. He charges ten rupees for a photo, he tells me. A new bride pops out of her tent, a black bindi in the middle of her forehead, plum lipstick on her mouth, her dusky skin powdered and rouged, dressed to be photographed. Are you ready, she asks the photographer, who holds up his flowery prop, indicating he is, as is the studio. I ask her if she will allow me to take her picture. He takes ten rupees; how much will you charge, she asks. When I explain that the picture I take will stay with me, she hides behind a wide smile and her tent, shakes her head, and says that it is not their tradition. Young men in groups saunter about aimlessly, twirling sticks like batons. Older men huddle together talking in tents or on chairs placed in the shade of tents. 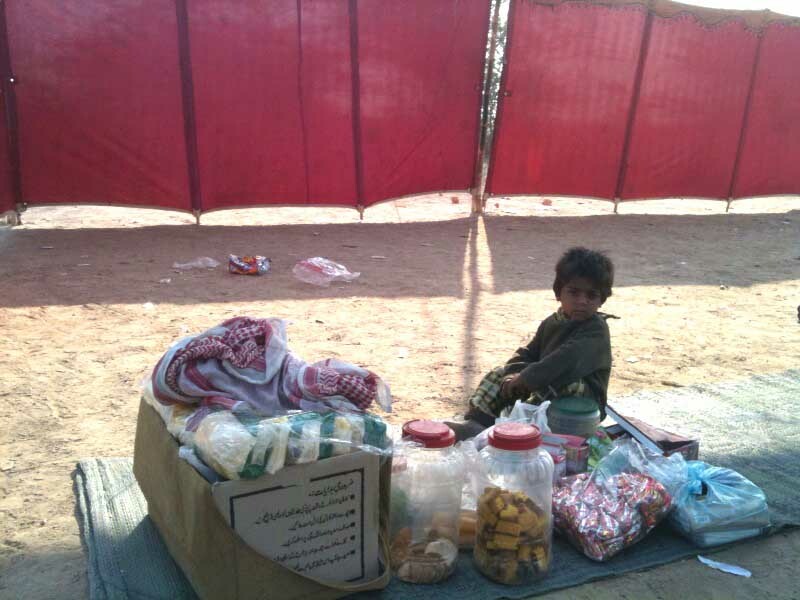 A small child, only just learning language, sits at a makeshift store, selling packaged popcorn, sweets and candied sesame seeds. The Keamari flood relief camp is one of many that have become home with daily routines sketched out for the hundreds of thousands of homeless who are unable to return to their villages. Those who have gone back regret it, the menfolk tell me, for their landlords, their feudal masters, are demanding a harvest of rice and wheat promised in exchange for seeds and fertilizer. The harvest that these rich ‘agriculturalists’ know never came to be because of the worst floods in Pakistan’s history. Our homes, already made of mud have dissolved into the earth, our fields destroyed, our animals dead or lost — what can we go back to, they ask. They insist that they would rather live in tents than go to that. This would be a catastrophic move for millions of Pakistanis. As UNICEF have revealed in their six-monthly findings, ‘a new humanitarian crisis: child malnutrition’ has developed. This is hardly surprising, you may think. Think again. The UNICEF Deputy Representative in Pakistan, Karen Allen describes the situation as ‘shocking, shockingly bad,’ adding that she hasn’t ‘seen levels of malnutrition this bad since the worst of the famines in Ethiopia, Darfur and Chad.’ I need not add that mass migrations to already overpopulated urban centers, malnutrition, unemployment and extreme poverty are problems that could lead to increased unrest, crime, (food) riots and all kinds of violence. These are all long-term problems, but we should try to reawaken some of the initial spirit that so many Pakistanis here and overseas showed in the immediate aftermath, and keep making any individual contribution we can. I passed by this camp the other day while going from Maripur to Muach Goth. It was sad to see that the people are still living here in this condition. Similar camps exist all over. The initial exuberance of many to help has died and those trucks that everyone was sending have stopped. It is no longer the buzz word and it is no longer cool to tweet and blog about PKFLOODS. But life goes on for these people…. their needs and their hunger continue. There are several great organizations still working to rebuild the devastated communities. I encourage all to donate to these organizations such as Oxfam, HANDS, Karachi Relief Trust, etc and help rebuild these communities. Thank you Naveen for highlighting this issue again. I just read the article about flood survivors, there is nothing surprising. By high lighting this issue time and again is just to make the joke of humanity. We are going to be senseless and this isnt only for those who have faced the destruction. This is a common behavior and anyone can feel it everywhere around. You can judge the same behavior at any of memorial ceremony. Just close relatives of the deceased person can feel the pain of tormented heart and remaining who actually come to share the grief; just make them busy in business talk and other gossips. We even don’t have sense to memorize our own death that could be the very next. It is the case with the flood survivors, like Naveen and me and many others can write or talk about this existing issue but no one have courage to do something. Even there is no relief camp in Lahore to donate something for these people. W e are preparing to celebrate Basant again in our city and meetings are being held at higher level to celebrate this Basant event but no one is thinking about doing something for those who are living in open sky in such a chilled and nasty weather. Our government has lost its sense for public issues and all our political parties and politicians are all fighting for one bone. So his is useless to expect something at government level but we, being human can do something rather than writing few lines. Thanks for writing in, Ayesha. Actually, I think that there was impressive individual effort as there always is in Pakistan where we have a great tradition of philanthropy. However, it is very common for these things to be forgotten. This was especially useful given the slow response from the rest of the world. The point of my post is that we should keep up the effort. Ayesha’s argument is unsound. Who is “we”? Are ALL of us senseless? Does Ayesha know “everyone”? Is she exposed to “everywhere around”? What does that mean, anyway? Many people have displayed extraordinary courage in trying to make a difference in any way they can, by rising up for many different causes, including in response to the devastating floods – often at great risk to their personal safety. Writing about an issue IS doing “something” – it is an action and it is not trivial. What is utterly annoying and exasperating, however, are whiners who pontificate about others not doing enough. Naveen, as individuals, we can only do *so* much. And that little, piddling drop in the ocean will make a tiny difference in someone’s life, and therefore, it is worth doing. I have two things in mind … one is to organize late morning/early afternoon art/storytelling activities for a small group of children – we need to find a bit of money to bus them over – I think it’s essential for them to step out of the space they currently inhabit – and the rest of the work will be done by volunteers. The other idea is far more challenging and long-term, and that is to move from welfare to sustainability through entrepreneurial opportunities. Maybe we can talk to a few people to create the equivalent of an angel fund and assess whether there are any potential leaders in the above-mentioned camp whom we can work with and mentor … in the hope of creating new, small businesses, which in turn can provide employment.